This is a great snack for any time of year. I personally serve it with Kalamata olives and sometimes even diced cucumber and/or bell pepper. Keep in mind that after blending, fine-tuning the mixture with slightly more tahini and/or lemon juice is often needed (see step 3). As a footnote, tahini is what gives the hummus its creamy texture and also reduces the strong taste of the garbanzo beans. For the longest time I did not like hummus until I realized adding more tahini is the key element for my taste preference. Another key to enjoyment is finding a pita bread you like. For many years I ate a commonly available pita bread, but then discovered a much thinner pita bread at a Middle Eastern market in my area. Thin or thick, white or wheat, just find the type you like and enjoy ! After taste testing, add additional tahini or lemon juice as needed for taste and consistency. Spoon into serving bowl. 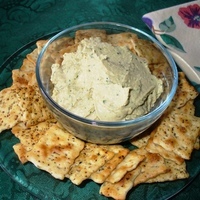 Create a shallow well in the center of the hummus; add additional olive oil in well. Optionally, sprinkle top with cayenne pepper and/or Kalamata olives. Keeps in fridge for 2 to 3 days. Each 24 hours in fridge however, blend in another 1 teaspoon water and optional 1/2 teaspoon olive oil before serving, as hummus often dehydrates in fridge storage. I have had the honor to taste this same Frosted Flaker creation, and I'm here to tell you IT ROCKS!! Thanks, Flaker, for sharing the details. I've since edited the recipe so as to tone down the amount of lemon juice and garlic. Previously it stated 2 tablespoons lemon juice and 3 cloves garlic. I'll add another comment regarding all this. Previously this recipe called for 2 tablespoons lemon juice, and 3 cloves garlic. I have since reduced the lemon juice significantly but feel free to increase the amount to your taste. Adding some chopped cilantro to the food processor in making gives yet another flavor perk! See photo #7. @ Salad Foodie - sounds like a flavorful addition regarding the cilantro. My first preference is to add fresh mint, but cilantro is great as well.